For me, one of the most striking aspects of our exchange was the perseverance and adaptability shown by the people living in Kangemi and Kawangware. They face poor living conditions and frequent displacement. However, what seem like harsh limitations also bear a huge potential for innovation. It was immensely impressive to see the Love School kids and local craftsmen working wonders with what they had. After gaining insight into their lives, I found it essential to reflect on the way we value our resources and to integrate this in my project. We are constantly producing new designs, while perfectly good objects and quality parts are discarded. How can people be made more aware of the possibilities that these items still hold? In this context, furniture is a relevant topic. While very little changes in its functionality, there is a seemingly endless stream of chairs and desks being churned out each year. Considering that our natural resources are ultimately restricted, this practise seems questionable. It raised the idea of learning from the inhabitants of the slums and working with materials, objects, parts that were already existing and freely available. These initial thoughts sparked an in-depth exploration of transitional structures, built using only found material. I sourced the scrap bins at university for remnants of old mock-ups and the streets of Neukölln for unwanted furniture. Furthermore, I tried to restrict myself to minimal tools during the experimentation process. 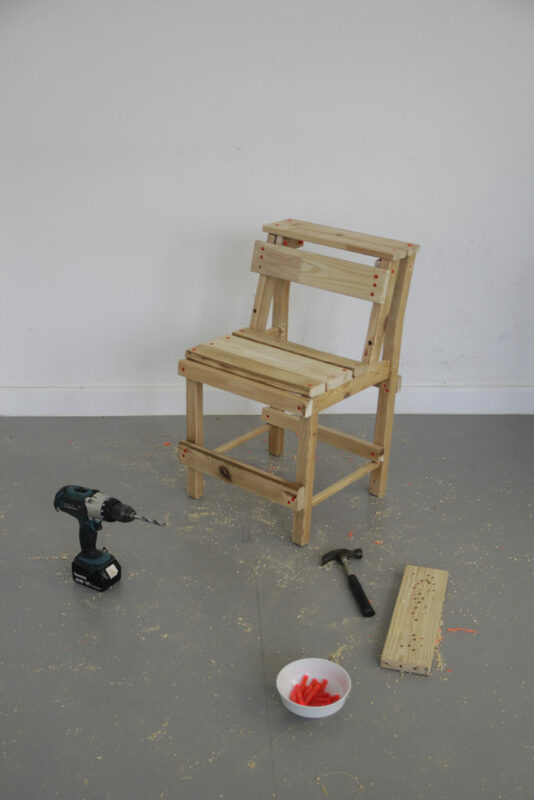 The idea was to develop an accessible design along the lines of Do-It-Yourself movements like Jugaad and Gambiarra. 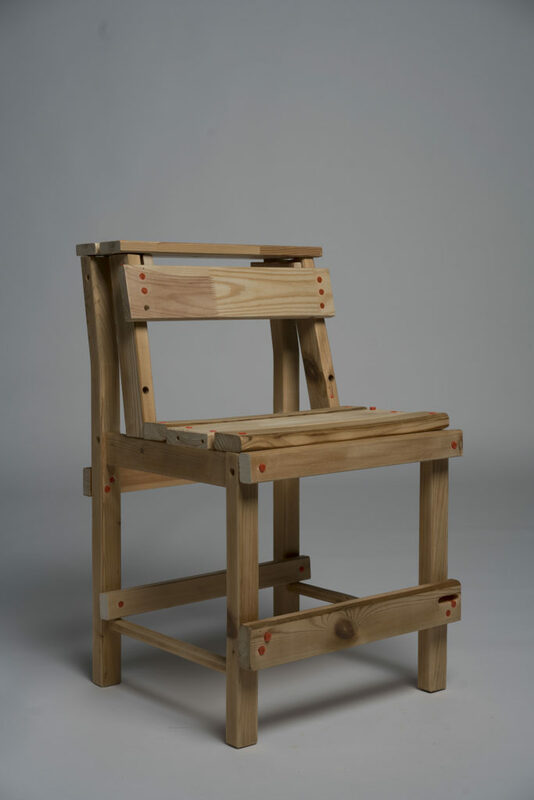 The result is Benchmark, a chair (prototype) inspired by the furniture in Nairobi slum schools. Commonly, their school benches consist of wooden slats, joined using nails. 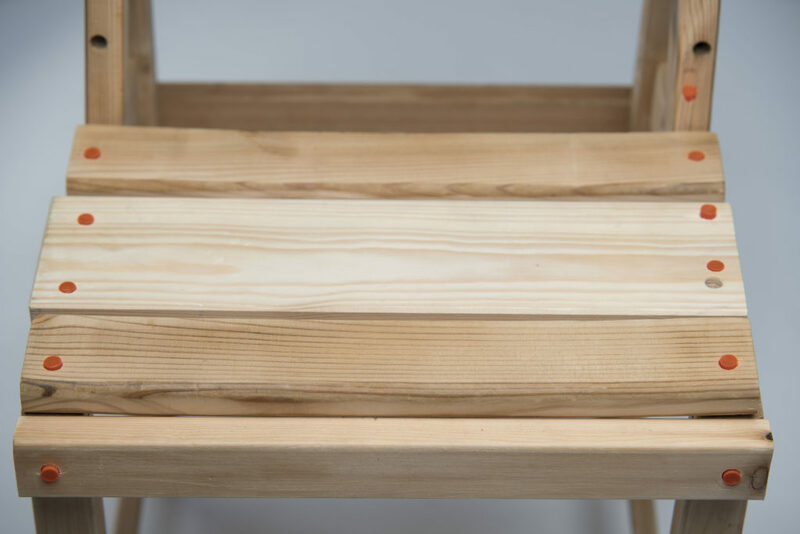 Technically, these desks can be produced using the most basic of hand tools, without the need of electric machines or fancy equipment. This makes them a perfect example for democratic design. In the case Benchmark, colourful acrylic dowels take the place of the nails. Their bright orange faces highlight the simple, almost primitive construction. It turns the rough, naïve aesthetic of DIY culture into a coveted design feature. Every piece is unique, as it is made entirely from reclaimed wood and furniture parts. 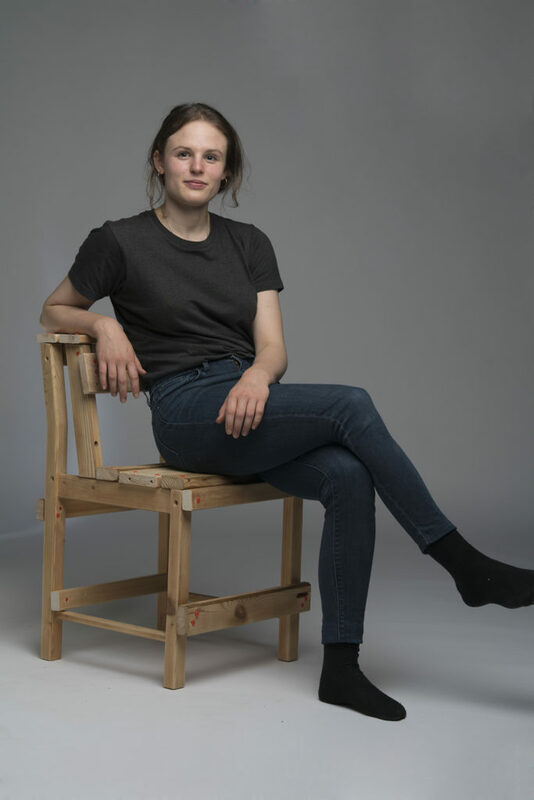 Besides raising money for the Love School, it hopes to inspire people to give broken, worn-out or undesired furniture a second chance.